When the rescuer arrived at the residence, she immediately noticed the emaciated and injured cat on the property. 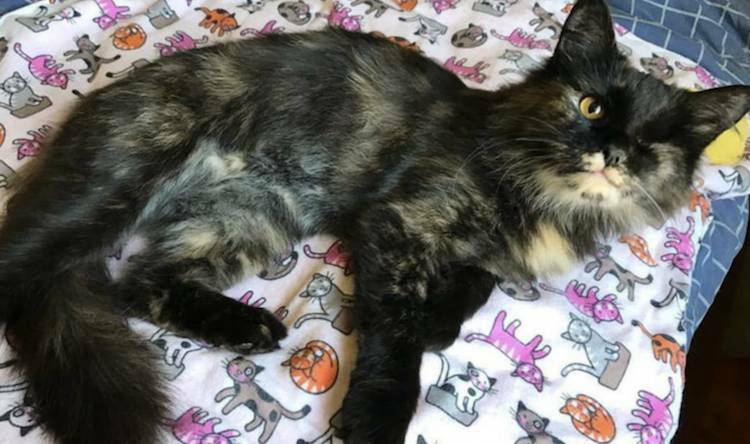 The owners confirmed the cat was theirs, but said they did not want her anymore. The rescuer then scooped up the female cat, who would later be named “Hermione,” and rushed her to our staff veterinarian, Dr. Lindsey Kerfoot at BAAC. At NHES’ flagship animal rescue, The Briggs Animal Adoption Center (BAAC), hundreds of dogs and cats per year find refuge from homelessness, neglect, and abuse. Hermione is one recent intake who touched us all with her determination to live, and to love. 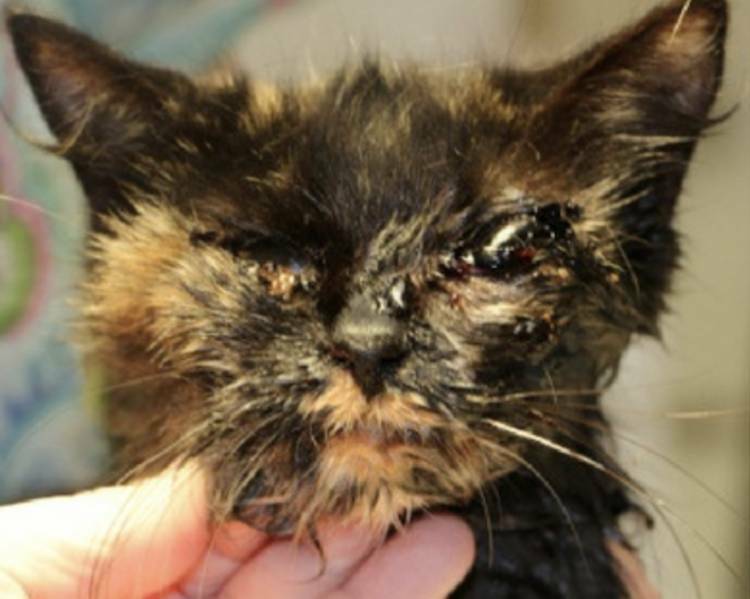 In April, a volunteer animal rescuer was contacted by the concerned neighbors of a family who owned a severely neglected cat. When the rescuer arrived at the residence, she immediately noticed the emaciated and injured cat on the property. The owners confirmed the cat was theirs, but said they did not want her anymore. The rescuer then scooped up the female cat, who would later be named “Hermione,” and rushed her to our staff veterinarian, Dr. Lindsey Kerfoot at BAAC. Dr. Kerfoot soon determined that Hermione had been shot in the face. Some small bullet fragments had gone through her little skull, causing permanent damage to her left eye and jaw bone. Some of the fragments exited through the back of her neck. Hermione was so underweight that, at 5 years of age, she weighed only 3 pounds. Once Hermione had gained enough weight for surgery, Dr. Kerfoot was able to successfully spay her and remove the damaged eye and loose jaw fragments. Hermione’s injuries were serious, but thankfully, she has made a full recovery. On May 27, 2017, she was adopted by NHES’ Development Coordinator, Hilary. Hilary tells us that she playfully gallops across the house at 5:00am, chirping and purring. Despite the violence inflicted on her by humans, she is very careful to not to scratch while playing, only allowing her soft paw pads to bounce off the hands of new human friends.